Extends from 10 to 110 ft.
*Please Note: The GPV Power Vent Terminal must be used in conjunction with an adaptor. Consult your appliance's user manual to determine the appropriate PVA adaptor kit. Napoleon fireplaces are quite flexible when it comes to installation, but some homes simply don't lend themselves to conventional direct vent configurations. Fortunately, this Napoleon GPV Direct Vent Gas Fireplace Power Vent Terminal was designed specifically to help deal with those kinds of difficult situations. This unique venting accessory allows your vent to snake around objects, such as a staircase, and terminate above or below your fireplace. 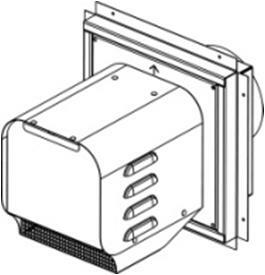 You can even use this power vent terminal to vent a fireplace that is a great distance away from an outer wall. So don't worry if your desired fireplace location isn't compatible with standard venting techniques. The Napoleon GPV Direct Vent Gas Fireplace Power Vent Terminal will allow you to have the fireplace you've always wanted without compromising the rest of your decorating scheme. Can this be vertically vented? Unfortunately, no. This item is only designed to be mounted horizontally.